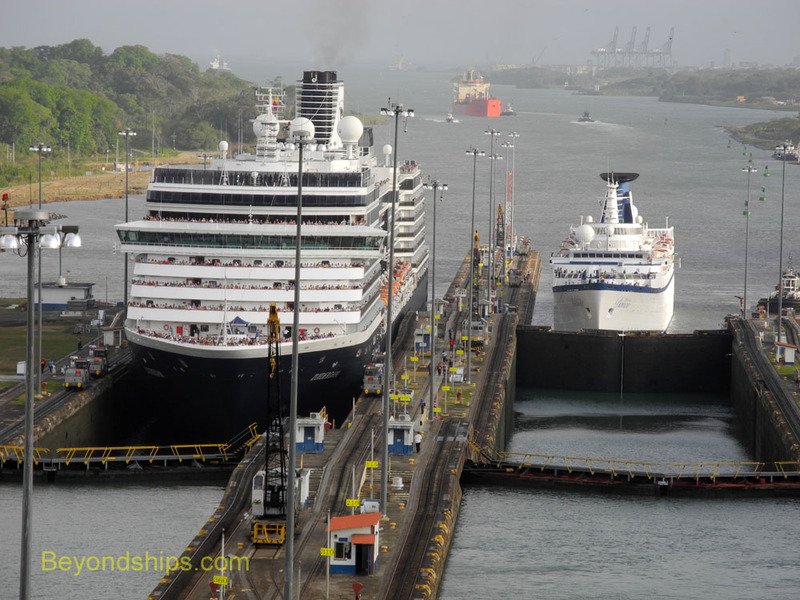 Cruise ships Zuiderdam and Princess Daphane in the Panama Canal. 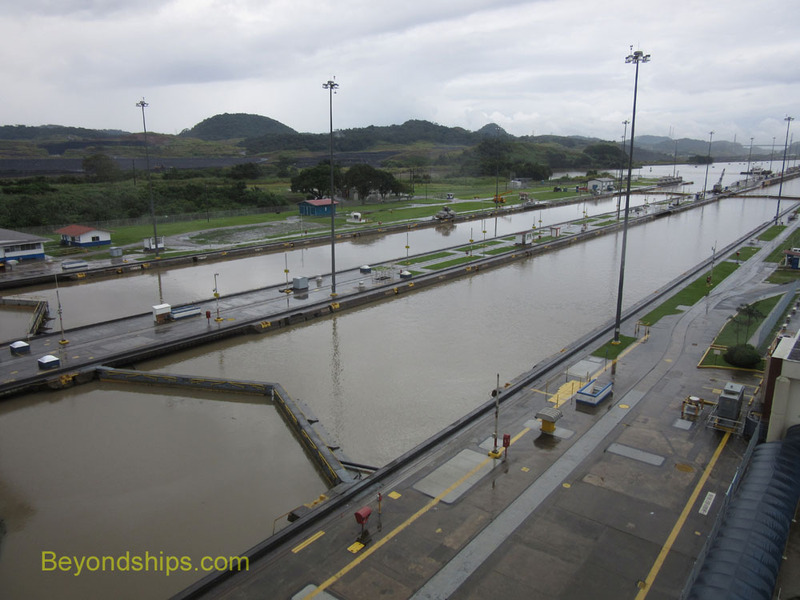 The Panama Canal is a multi-faceted waterway. Ships do not simply start at one end and sail directly through to the other. Rather, distilled to the basics, they sail through a channel, are raised up through a series of locks, sail through a man-made lake, go through a cut in the mountains, sail through another man-made lake and are lowered down through another series of locks. Let's follow a ship sailing from the Atlantic side to the Pacific. Surprisingly, this is not a journey from east to west but a voyage southwards. The land connecting North America to South America bends at the point where the Canal is and so the Canal actually runs more north to south than east to west. The voyage begins at Limon Bay. This is a vast area surrounding the port of Colon, Panama. 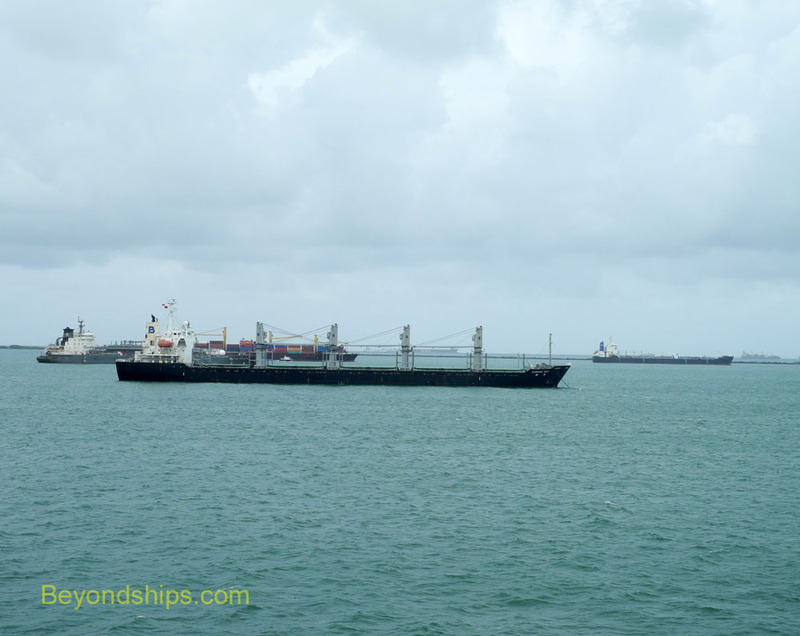 There are usually numerous ships anchored in the Bay waiting for their turn to enter the Canal. 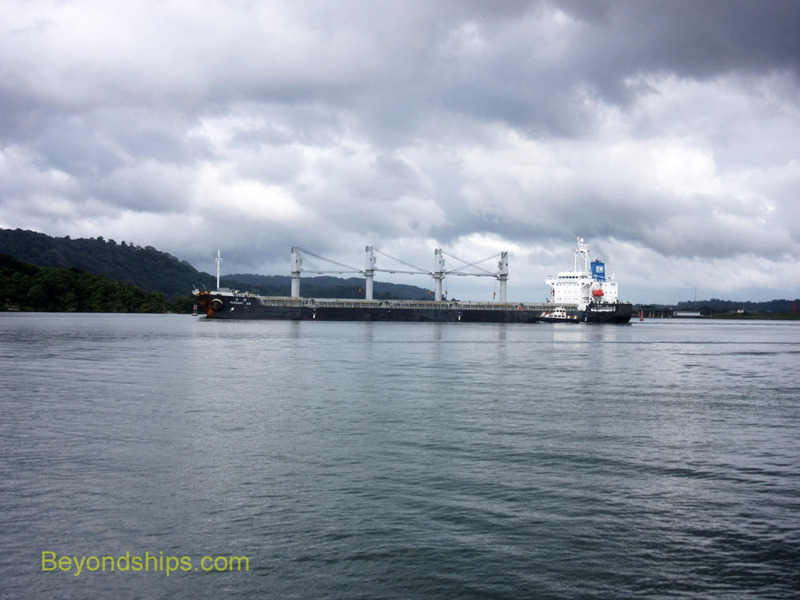 From Limon Bay, the ship sails up a channel to the Gatun Locks. 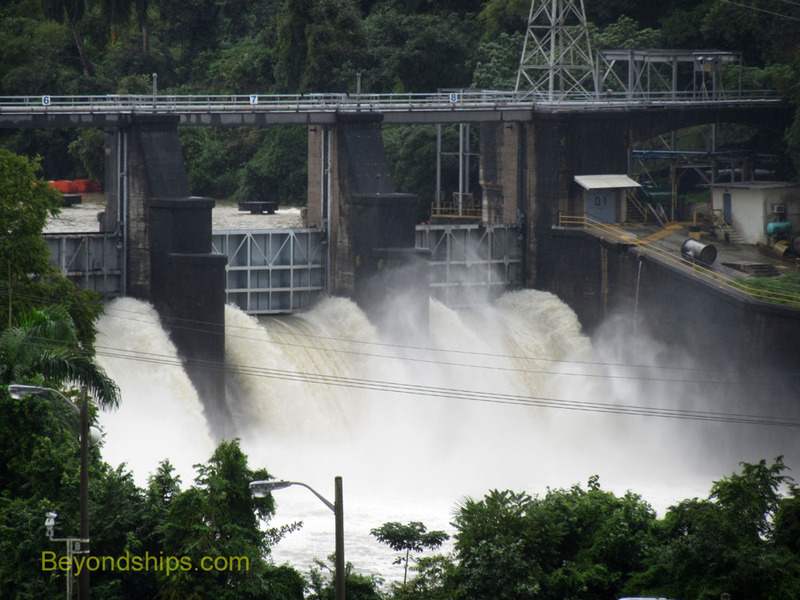 The Gatun Locks are a three stage system. In other words, a ship must go through three chambers as it is raised some 87 feet to the level of Gatun Lake. Giant steel doors divide the three chambers. A row boat brings a set of lines out to the ship as it approaches the entrance to the lock. Other ways of getting lines out to the ships have been tried over the years but the row boat method remains the most reliable. The lines are attached to the ship and to locomotives (called “mules”) on either side of the lock. While it looks like the mules pull the ship through the lock, the ship uses its own propulsion. The mules are just to position the ship within the lock. When the ship is in the first chamber the giant doors close behind it. The doors are hollow and even though they are enormous their buoyancy allows them to be moved with a relatively low power engine. The chamber then fills with water. The water comes from Gatun Lake through tunnels large enough to hold a subway train. All of the water flow is done by gravity. Once the water in the chamber is filled to the same level as the water in the next chamber, the doors at the front of the ship open and the ship sails into the next chamber. The same process is repeated. 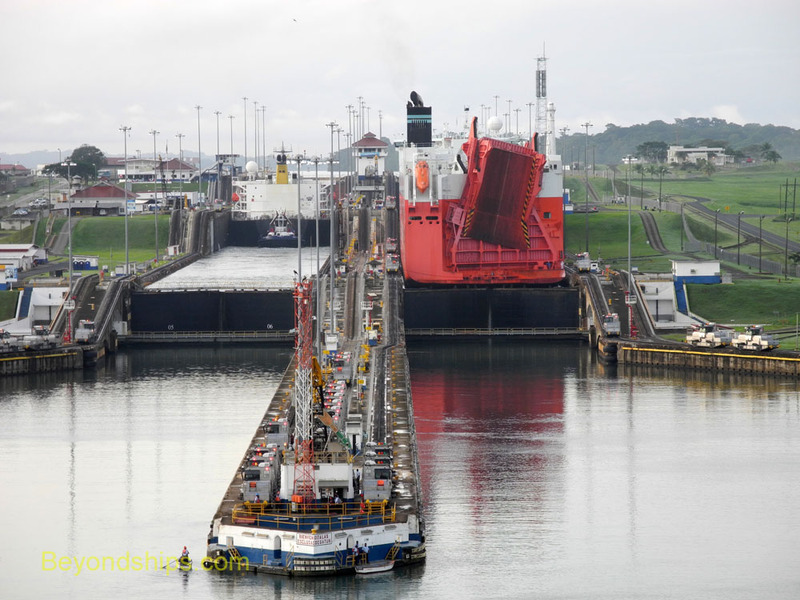 Since there are three chambers at Gatun Locks, the process occurs three times. 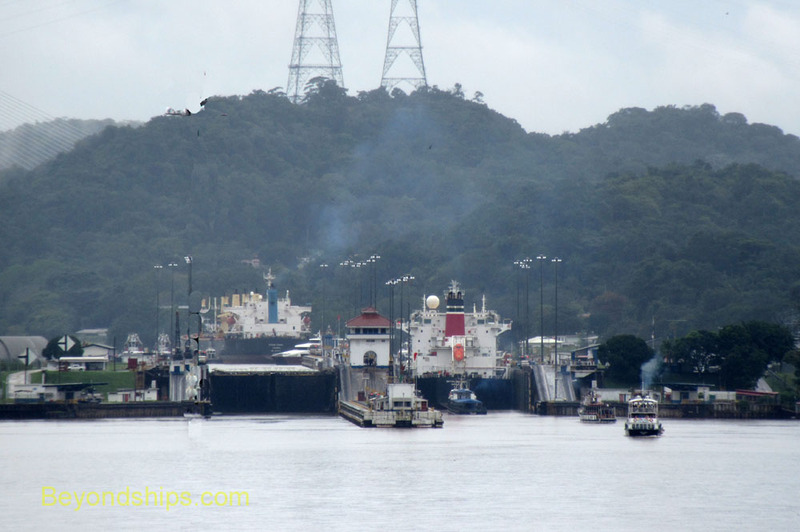 There are two sets of locks at the Gatun Locks. Thus, more than one ship can transit the locks at a time. Indeed, since the chambers operate independently, you often see more than one ship in the chambers that make up one set of locks. Upon exiting the final chamber, the ship sails into Gatun Lake. This lake was created by damming the Chagres River. It covers about 180 square miles. Surrounding it is thick jungle that encompasses wildlife sanctuaries and the homes of native people living in their traditional manner. The Lake not only supplies the water for the locks but also the drinking water for Panama City and Colon. Cruise ships making a partial transit of the Canal anchor in the Lake and tender passengers ashore for shore excursions before sailing back through the Gatun Locks to Colon. Other ships sail some 16 miles through the Lake to the Culebra Cut. Also called the Galliard Cut, this man-made excavation takes the ship through the mountains and across the Continental Divide. The Culebra Cut was one of the most difficult parts of building the Canal as landslides plagued the construction. Along the way, the ship passes under the Centennial Bridge. At the end of the cut, the ship enters the Pedro Miguel Locks. This is a one stage set of locks but operates in much the same way as the Gatun Locks. Next, the ship sails through Miraflores Lake. This one mile stretch of water is also an artificial lake created for the Canal. The ship then enters the Miraflores Locks. A two-stage set of locks, the Miraflores Locks lower the ship some 54 feet to the level of the Pacific. From Miraflores, the ship sails down a channel past the port of Balboa and past Panama City. Along the way, it passes under the Bridge of the Americas, often viewed as the final landmark in a journey through the Canal. ﻿Above: Ships in Limon Bay waiting to enter the Canal. Above: A ship crossing Gatun Lake. Above: The Pedro Miguel Locks. Left: Water being discharged from Miraflores Lake. Below: The Bridge of the Americas.